The first time I saw someone fishing from a standup paddleboard, I thought I was looking at the greatest thing since sliced bread. I imagined myself carrying the board everywhere, paddling the shallows, sight fishing everything, and looking as cool as a dude in a Corona commercial. The first time I paddled a SUP, I had a different experience. The damn thing was so tippy. It took some muscle. And carrying a ton of gear was out of the question. That was years ago and since then SUP manufacturers have worked hard to overcome these early paddleboard fishing challenges. Vibe Kayaks made a big splash when they first introduced a line of feature-filled, value-priced fishing kayaks. This year, Vibe added a unique standup paddleboard to their line sure to make waves with anglers and paddlers alike. Company owner Joshua Thomas explains Vibe didn’t want to jump into the competitive world of standup paddleboards with a design just like everything else on the water. Instead, they designed and manufactured something completely different—the Maverick 120 SUP. 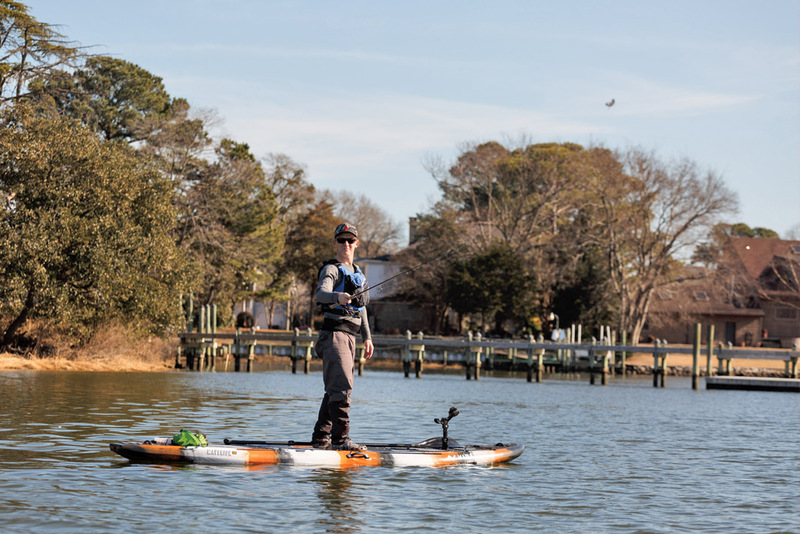 “We came up with a rotomolded, foam-injected SUP combining the best features of kayak and board,” he says. What Does The Foam Injection Do For The Maverick? Vibe already makes coolers, Thomas explains, “We wanted to see if we could fill something larger with foam.” After a year of research and development, they had perfected the process. “We start with the rotomolded plastic shell, slightly thinner than our kayaks to save weight, and inject it with foam.” The biggest challenge was venting the board so no air is trapped inside. Filling the board with foam makes the Maverick stiff, like a foamcore SUP, so the board doesn’t flex, bend, dent, oilcan or ding. It won’t sink either. While the foam does make the board heavier—at 72 pounds, the Maverick weighs as much as some kayaks—I could still lug the board to the water under one arm, like a really strong guy in a Corona commercial. However, a small cart made moving the board way easier. Handles on the nose and tail as well as in the center of the board and on the rails offer plenty of places to grab the board. The tough plastic shell made it possible to just drag the board from place to place. Like Vibe’s kayaks, the Maverick comes rigged and ready to go. There are gear tracks in front and behind the center carry handles and one across the bow on the paddling side of the crisscrossed bungee tie-downs. An eight-inch deck hatch will hold keys and cellphone in a drybag. The deck is covered with foam padding from nose to tail for better grip anywhere you’d walk on the board. A half-dozen D-rings are placed along the length of the board to tie down a small cooler or seat, turning the standup board into a sit-down kayak. 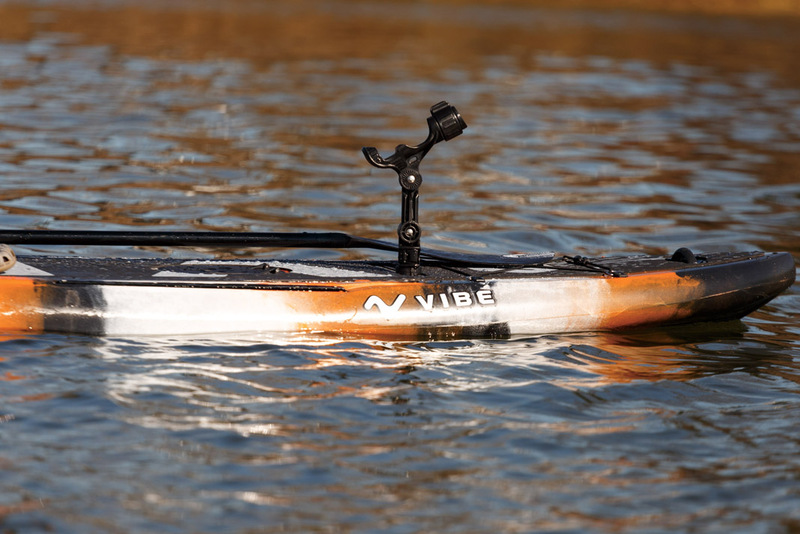 Vibe also throws in an aluminum paddle, which is cool, but you’ll probably want to upgrade after a few trips on the water. The weakest point on many paddleboards is the thin, plastic fins. Sure, they aid in keeping you straight in wind and swell but they are also first to break on rocky landings. The Maverick has molded fins, which, according to Thomas, won’t break and actually reduce draft. This makes for a simple system but is a bit of a bummer if you’re the type of paddler who likes to fine tune your ride with different fin lengths and patterns. On the water, the channeled hull and aggressive up-turned nose give the Maverick the performance to handle moderate seas and cover a few miles in search of fish. On the topside, the open, flat deck makes it easy to stand up and fish. Add an available seat or small cooler, and you can sit down, relax and paddle. The weight requires more power to get moving, but once it’s up to speed, the Maverick cruises along. The board carries stability from nose to tail. To make it easier to turn, move towards the tail to lift and pivot the nose into the air. For a more powerful stroke, shuffle towards the center for trim and for more paddle blade in the water to keep the board tracking straight. Like the early standup paddleboards, the Maverick still feels tippy to me, initially. The trade-off of less primary stability is improved performance with more speed and better handling. A slightly V-shaped hull cuts through the water and helps the board paddle straight. The more strokes I can take without having to switch my paddle to the other side of the board, the faster I go with less energy and less frustration. At 33.5 inches wide, the Maverick has sufficient secondary stability to keep me upright as I leaned from side to side. After banging the Maverick around oyster reefs and dock pilings, I can say confidently the foam-injected, rotomolded construction is pretty much indestructible. 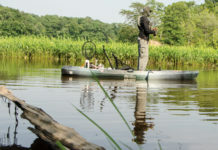 The Maverick combines features of a rotomolded kayak and a foam-filled hard board to create a new type of hybrid anglers will feel comfortable using and abusing. A true maverick thumbs his nose at convention in search of a better solution. Vibe’s foam-injected, rotomolded Maverick SUP is true to its name.